An army of 24,000 temporary workers have swarmed the Gulf Coast to help clean up the mess from the massive BP oil spill. But it is far from clear who is responsible for ensuring the safety and long-term health of those doing the critical and often dangerous grunt work. Already workers have been injured, some hospitalized. Workers are covered by a patchwork of federal, state and local agencies and regulations. The government only last week announced how worker safety efforts in the Gulf would be coordinated, more than 50 days after the rig explosion. The rapid deployment of a vast work force over four states. Hot temperatures that make wearing heavy protective gear extremely uncomfortable. A large number of non-English speaking workers involved in the effort. The desire among many workers sidelined by the disaster to do any work they can. Based on past disasters, workers could become tangled in years of litigation if they suffer any injuries or other ill health effects while cleaning up the Gulf region. “We’ve been through this before,” said Rep. Jerrold Nadler, D-N.Y., referring to workers who helped clean up the World Trade Center site after the 9/11 attacks. 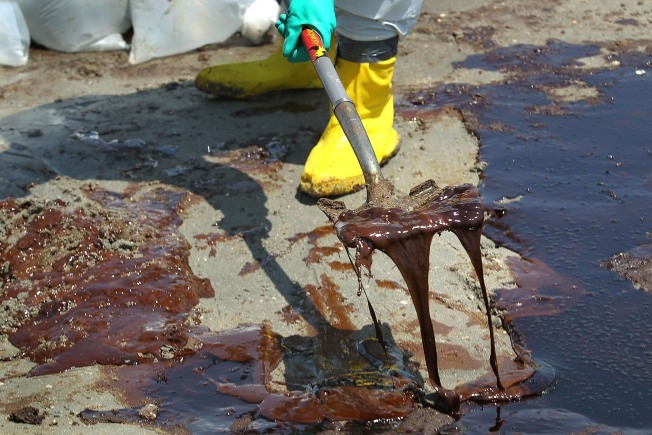 Similar sentiments have come from those who remember the 1989 Exxon Valdez spill, which is more similar to the Gulf spill because there is a corporate entity ultimately responsible. But it is not completely clear which agency is running the cleanup under the so-called “unified command” of BP and the federal government. And even within the government there is confusion about who is in charge of protecting the 24,000 individuals engaged in the Gulf cleanup, including nearly 19,000 contract workers dispersed offshore and along the coast lines of Louisiana, Mississippi, Alabama and Florida. Alabama Gov. Bob Riley told CNN last weekend that the “committee” approach of government agencies was complicating the process. He pointed to a situation where the state Department of Fish and Wildlife’s push to clean beaches met with resistance from federal Occupational Safety and Health Administration over limits on how many hours cleanup crews could work. Adding to the complication is the fact that OSHA typically oversees safety on land, while the Coast Guard deals with worker safety issues on inspected vessels. That means smaller boats that are not inspected by the Coast Guard would come under OSHA. While OSHA has responsibility for protecting workers, the agency is stretched extremely thin, with only has 25 staffers in the four-state spill region, according to Jordan Barab, deputy assistant secretary of Labor for OSHA. Workers in the Gulf already have seen their safety compromised. On Friday, an accident on a supply vessel southeast of Cocodrie, La., caused the release of natural gas, injuring 36 workers, with symptoms ranging from trouble breathing to nausea. All affected workers have been released from the hospital, according to Kelly Parker, a Coast Guard petty officer. Accidents are to be expected given the Herculean task BP and its contractors face getting thousands of workers trained and equipped with the necessary protective gear, everything from gloves to full-body coveralls. But some worker advocates and environmental experts say workers are not getting enough training or safety gear. “Are people going to fall between the cracks? Unfortunately probably so,” Ed Foulke, former head of the Occupational Safety and Health Administration under the Bush administration and now a partner at Fisher & Phillips, a national labor law firm. Workers are protected by "a hodgepodge of regulations,” said Matthew Shaffer, an attorney with Houston-based Schechter, McElwee, Shaffer & Harris, a firm that handles maritime-related personal injury cases, who said he has already heard from injured oil spill workers. He expects to see many workers come down with illnesses stemming from on-the-job conditions. “No one’s really in charge, and a lot is left to employers or the industry to police themselves,” he said. Miriam Rotkin-Ellman, with the National Resources Defense Council, said at least 11 workers have been hospitalized with dizziness, chest pains and coughing, among other ailments, and doctors have diagnosed some of the workers as having been exposed to inhaled irritants. "There is equipment to prevent these health impacts,” she said. “Respirators should be used in areas where there are toxic fumes." BP spokesman Ray Viator said the company has tested air quality and has deemed that respirators are not needed under government guidelines. Yet another government agency, the National Institute for Occupational Safety and Health, is conducting air quality tests to decide whether additional safety gear is needed. OSHA’s Barab said workers are “staying upwind” of the fumes and “staying out of the smoke,” so regular use of respirators is not necessary. He said OSHA officials are continuing to evaluate whether they may be needed. BP’s Viator said workers are given training before they do field work. The amount of training varies depending on roles and assignments. According to OSHA guidelines workers involved in general trash and debris beach clean need one to two hours of training; those coming in contact with oil byproducts such as tarballs need four hours of training; while those who face the greatest exposure to oil-contaminated shorelines or do cleaning or boom work off of vessels need at least 40 hours of training. But some workers may be falling through the cracks. Clint Guidry, president of the Louisiana Shrimp Association said many shrimpers who are working 60 miles offshore, doing some of the most difficult work, are only getting minimal amounts of training. “These gentlemen are put on the job site without any previous experience,” he said. But the work can pay boat owners up to $3,000 a day, a huge boost for shrimpers have been hit hard by the spill and previous hurricane-related damage. Field workers and deck hands can make $18 to $35 an hour, according to Guidry and other sources. BP declined to comment on how much workers are being paid. Guidry is also worried that workers have not been given respirators, especially those involved in burning off oil or working near areas where toxic dispersants are being used. So what will happen to BP workers if they do get injured or suffer long-term illnesses? BP spokesman Viator said workers' compensation is provided through the contract workers’ employers. That’s not enough, said Nadler. “Unlike at the World Trade Center, you have a private party who’s responsible and who should be covering the costs for all of this," he said. In the Exxon Valdez disaster, many workers claimed they suffered long-term health effects from cleaning the oil but got no benefits, said Charles Wohlforth, who was the lead reporter for the Anchorage Daily News coverage of the spill. On the Gulf Coast, training classes for more than 100 workers in hazardous material cleanup started last week, but some of the work had started even before the training was completed, according to Tim Kerner, the mayor of Jean Lafitte, La.